Not into hunting, but dig the way a deer head looks on the wall? Check these out. Not your Grandpa’s taxidermy hobby. We’ll start at the top. Stag Head made by designers Kelvin Goddard and Lisa Santana has a 24-karat gold plate finish. For more information contact: Avenue-Rd.com. If you are looking for something a little less fancy, try nearanddeer.com where you will find Not only deer but elephants, sharks and t-rex’s. I’m sure we all know someone who would needs a t-rex on their wall. You can also pick one up at West Elm as well. It’s the pet that doesn’t need to be walked and will not leave hair on your couch. Design Tip: Have a blank wall you would like to make a focal point? Wallpaper or paint and add an animal head. Ex. 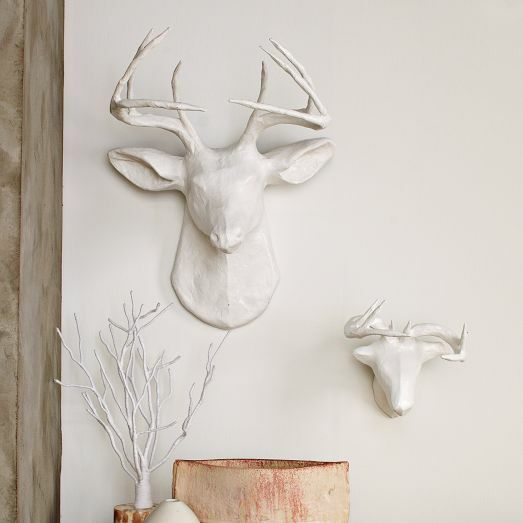 Dark gray wall, white stag head. Try this over a fireplace for some humor.